In Montgomery County, Kelly Taylor is ready to go to college and takes her autistic brother, Tom, to a specialized institution. However, the bank informs her that she does not have sufficient funds in her account to honor her check. Her stepfather, Johnny Gaveneau, withdrew the money from her account the day before. When Kelly arrives home, Johnny reveals that he used the money to buy a tiger for his ‘safari show’ project. In addition he has the house reinforced, in order to protect it from hurricanes, so all the windows and external doors are covered with wood. When Kelly awakes, she finds that the starving tiger is inside the house and Tom and she are trapped with the ravenous animal. You’re locked in a house together with your autistic brother who is hard to handle and you are attacked by an intruder and a cat-and-mouse game starts. 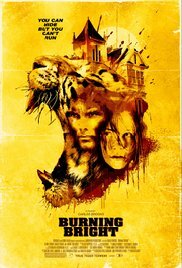 In this film “Burning Bright” they have taken the cat part quite literally, because it’s not some kind of escaped psychopathic madman who loves to have charming good-looking women for breakfast, but a full-grown tiger who hasn’t eaten for already two weeks. The only thing Kelly needs to take care of, is to stay away from the tiger’s claw’s. An original idea for a movie. I can’t remember that it was already used in another film. That’s the only thing that’s original in this film, the tiger, because the rest is so predictable. It’s an exciting Saturday night movie which is pleasant to look at (and not only because of the beautiful Briana Evigan). Kelly Taylor (Briana Evignan) is about to go to college and wants to put her autistic brother Tom (Charlie Tahan) in a special home. When she can’t pay the bill, she is forced to take him back with her again and return to her stepfather Johnny Gaveneau (Garret Dillahunt) to find out where the money went. It appears that the stepfather bought a tiger for his wildlife park that he would like to open shortly. Kelly and Tom’s mother apparently committed suicide in the past, after which Kelly was solely responsible for the education of Tom. And then they end up in the home of her stepfather, which is hermetically sealed with wooden boards because of the oncoming storm, along with the hungry tiger. Revealing more is a bit absurd, otherwise there’s nothing left to look forward to. It’s evident that a hell of a manhunt between predator and humans is the result. It becomes an unnerving game between the two in which Kelly uses all her talents (she has developed those skills during her membership at the local scouts as they organized far-reaching survival games I guess) while keeping her brother under control. He doesn’t want to be touched (otherwise he starts yelling hysterical, which in given the circumstances is not advisable ) and when he’s hungry, he starts screaming for food resolutely (and after a while again louder and louder. Again not recommended). The motivation to carry out this plan of them trapped with the tiger, is one that we have already seen in hundreds of movies. The final denouement was not very original. And the corny closing was also one to frame along all the well known corny moments out of the film world. The acting itself isn’t that bad. Meatloaf was introduced as a surprise act at the beginning of the film as the seller of the tiger. I didn’t recognize him immediately, because he’s quite shrunk in volume. Garret Dillahunt (“12 Years a Slave“, “Looper“) has a limited role as a future owner of a park and as cruel stepfather. Briana Evignan is really a picture and a female version of John McClane. For me, the best fragment was the exciting moment when she tries to escape through the “dirty laundry” shaft. Charlie Tahan (Ethan from “I am Legend“) began to get on my nerves with his autistic behavior, but for someone of his age I thought it was top acting at times. However, the great stars of the film were Katie, Kismet and Schicka, the three tigers that were used.Beside some silly flaws, it was an enjoyable movie. I found it odd that in one moment an oak door wasn’t an obstacle for the tiger, and it broke in two with some hard whacks from the tiger. But some wooden boards of a closet apparently were more resistant to this animal force. And I would have rammed that sharp object right into his eye for sure. A typical cliche story with quite some excitement. Good for a rainy Sunday afternoon!